Division of Theoreticaly Astronomy group is unified to Division of Science from 2019/04/01. The webpage of the new group is under construction. This wite covers the information of the new group until the new website is constructed. The "photon vortex" is a special quantum state with the specific angular momentum and coherent quantum phase in the macroscopic scale. It is thought to be easily generated in pulsars and gamma-ray bursts surrounding general-relativistic compact objects, i.e. neutron stars and black holes, and affect various cosmic phenomena. In the laboratory system, the "photon vortex" has already been generated as one of the modes of the ultra-high brightness laser, and the wide engineering application is expected. However, many theoretical works to clarify the nature of "photon vortex" was limited to the study in terms of classical electromagnetism. We have calculated, for the first time, the Compton scattering of electrons and the most fundamental "photon vortices", which are called Laguerre Gaussian waves, in relativistic quantum mechanics. On the basis of this successful result, it is highly desirable to make the next generation polarimeters capable of distinguishing "photon vortices" from circular polarized light, if they are equipped on the Satellite Observatory INTEGRAL-SPI or the solar power sailor IKAROS. With this apparatus, one would be able to observe more details of the magnetic fields and the electron energy at the source of the "photon vortex", which opens new era in the frontier research of magnetic field in space. 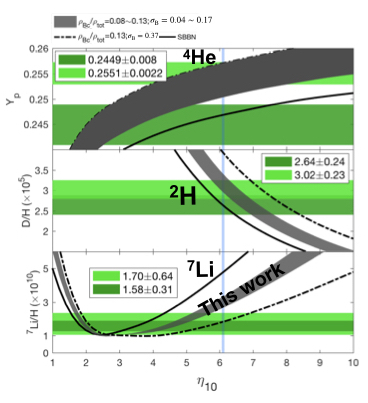 Can inhomogeneous primordial magnetic field solve the "Big-Bang lithium problem"? The standard model of Big Bang Nucleosynthesis (BBN) predicts primordial abundances of the light elements, except for 7Li, in reasonable agreement with observational constraints, which is called the "Big-Bang lithium problem" in the standard cosmology. We investigate the effects on BBN arising from the presence of a primordial magnetic field (PMF) whose strength is spatially inhomogeneous as expected from the observed CMB anisotropies. If the domains exhibit different temperatures from one another at the BBN epoch due to the fluctuations of local energy density of the PMF, the effective distribution function of particle velocities deviates from the Maxwell–Boltzmann distribution when it is averaged over the domains. Our BBN calculations by taking account of this effect of PMF fluctuations proved to reduce significantly the primordial 7Li abundance, thus relaxing the tension of "Big-Bang lithium problem". 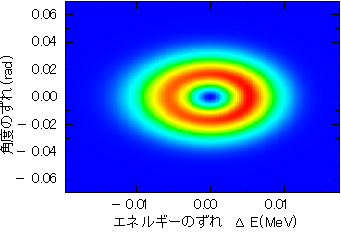 The figure shows that the abundances of 4He, D/H, and 7Li/H as a function of the baryon-to-photon ratio η. The boxes show the adopted observational constraints. The gray region shows that with inhomogeneous PMF, the 7Li abundance can be significant suppressed to a regime which is more consistent with the observations. Type Ia supernovae are being used as the standard candle in cosmology, but their explosion mechanism is still unclear. They are thought to be the explosion of carbon-oxygen white dwarfs, and their ignition is triggered by the carbon fusion reactions. The cross sections of the carbon fusion were poorly known and subject to large uncertainties in the ignition condition of supernova explosions. A research group in Italy has recently reported a new experimental result in Nature, suggesting that the reaction rates are several tens of times larger than conventional ones due to molecular resonance. 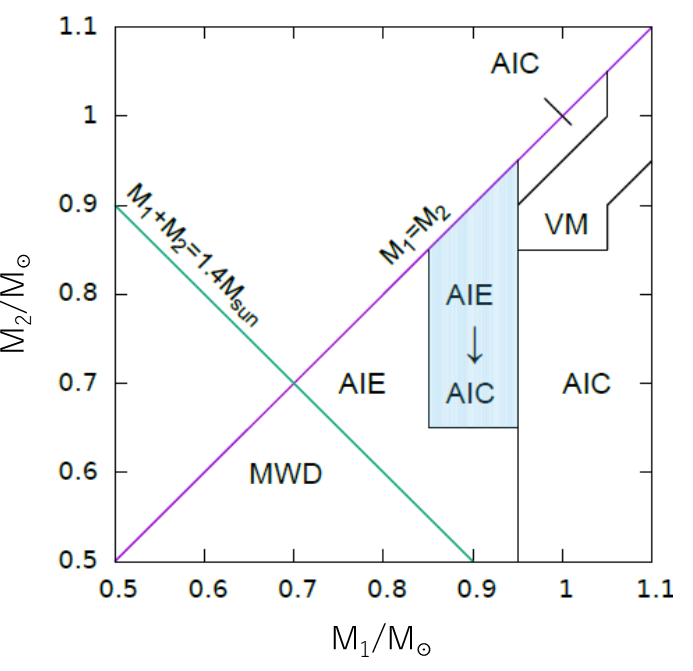 We evaluate theoretically if the reported resonance parameters are in reasonable agreement with quantum mechanical constraints and apply their new enhanced cross sections to the ignition of supernovae. It is found that white dwarf binary mergers tend to collapse to a neutron star at higher rate than exploding as a supernova. Figure: The fate of white dwarf mergers with and without the enhanced resonance contribution to carbon fusion reaction rate. M_1 is the mass of the primary star and M_2 the mass of the secondary. The blue region shows the systems whose fate changes, depending on the different reaction rates with and without the resonance. 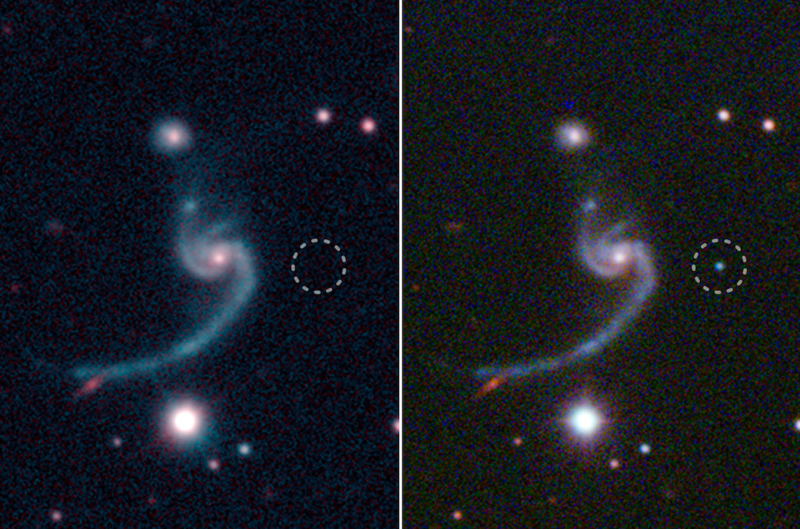 An international research team including Takashi Moriya at DTA/NAOJ discovered the first recorded "ultra-stripped supernova," a rare, faint type of supernova that is believed to play a role in the formation of binary neutron star systems. These findings will advance our understanding of a wide variety of topics ranging from gravitational waves to the origin of precious metals like gold and platinum. This research was published in Science on October 12, 2018. See the full story: DTA Press Release "Little Supernova is Big Discovery: the Origin of Binary Neutron Stars"